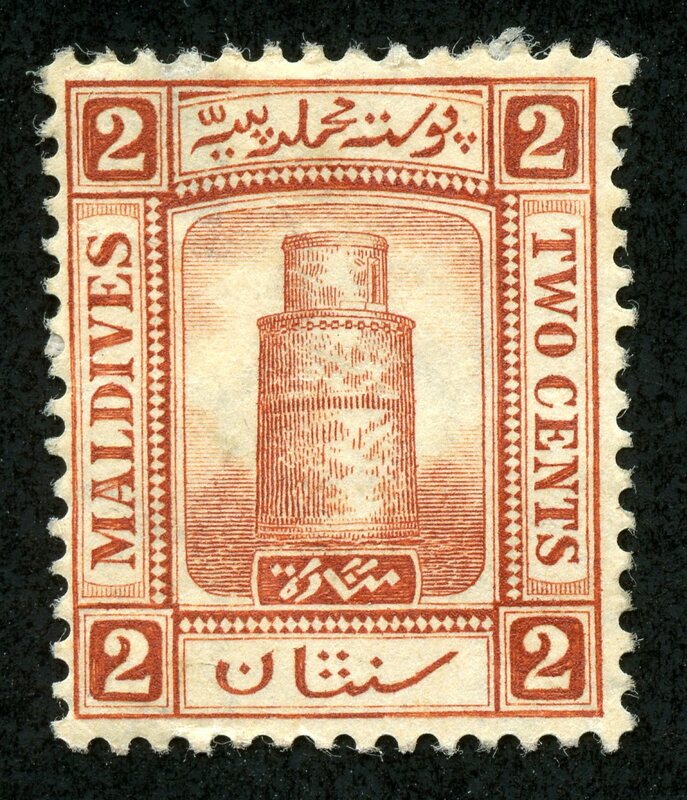 "Minaret of Juma Mosque, near Male"
The Maldives archipelago of some 1200 islands (192 inhabited) is located in the Indian Ocean 400 miles from Ceylon. 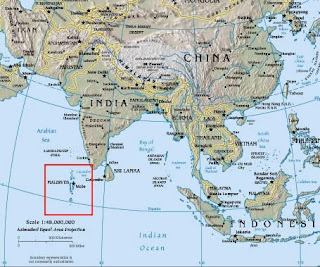 The atolls are spread out over 35,000 sq miles (90,000 sq km), with an average ground level of 5 feet, the highest point at 8 feet. As one can imagine, tsunamis, and predictions of higher ocean levels are of ongoing concern. 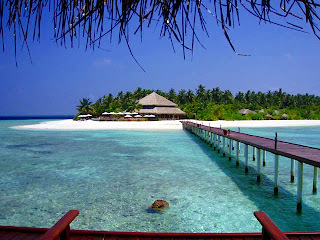 The Maldives were originally explored by the Portuguese in the 15th century, then by the Dutch in the 17th century. 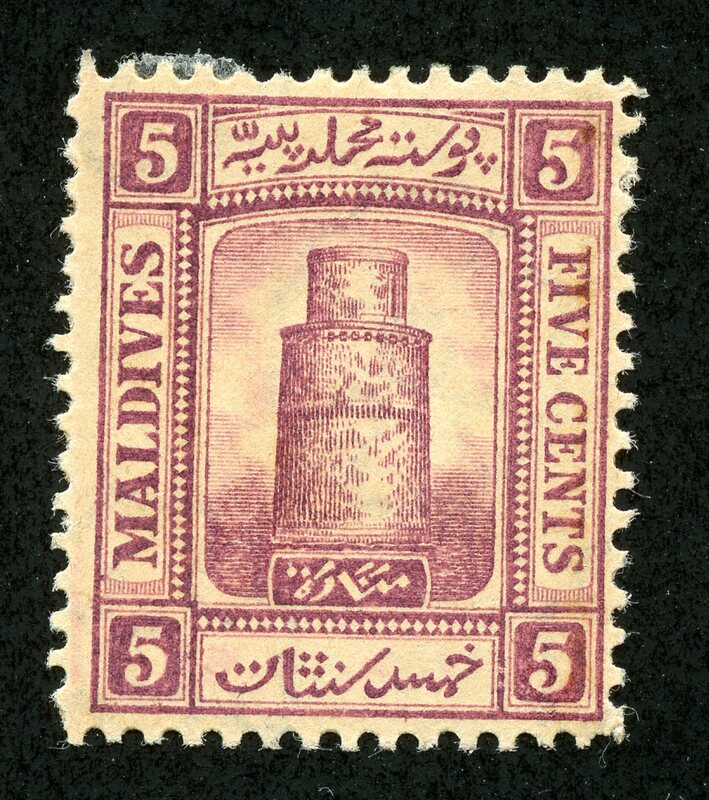 But in 1887, the Sultan of the Maldives signed an agreement with the British Ceylon Governor that made the territory a British Protectorate as a dependency of Ceylon, albeit with internal self-government. The people are ethnically Maldivians, speak a Devehi language, are of the Sunni Islam faith, and comprised about 100,000 people in 1905. During the British Protectorate era, which lasted until independence in 1965, the country was ruled internally by Sultans. In 1968, a Republic was established. The Scott Classic Specialized catalogue has, from 1906-1952, 30 major stamp descriptions. Of those, 16 are CV <$1-$1+, mostly the latter 1950-52 issue. 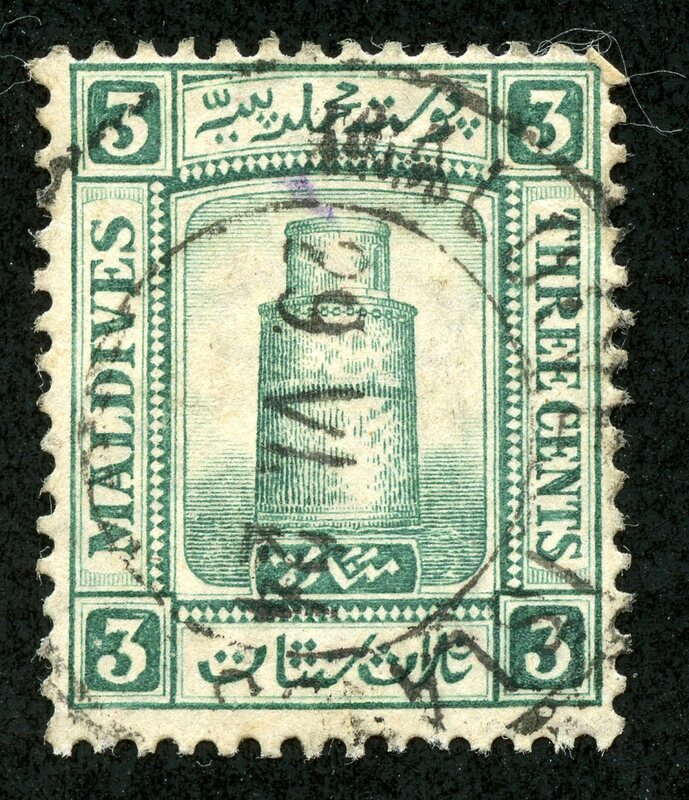 As noted, there is no stamp production for the Maldives themselves until 1906. 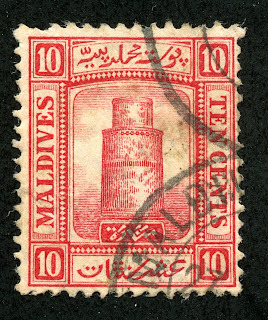 Otherwise, the stamps of Ceylon must have been used? 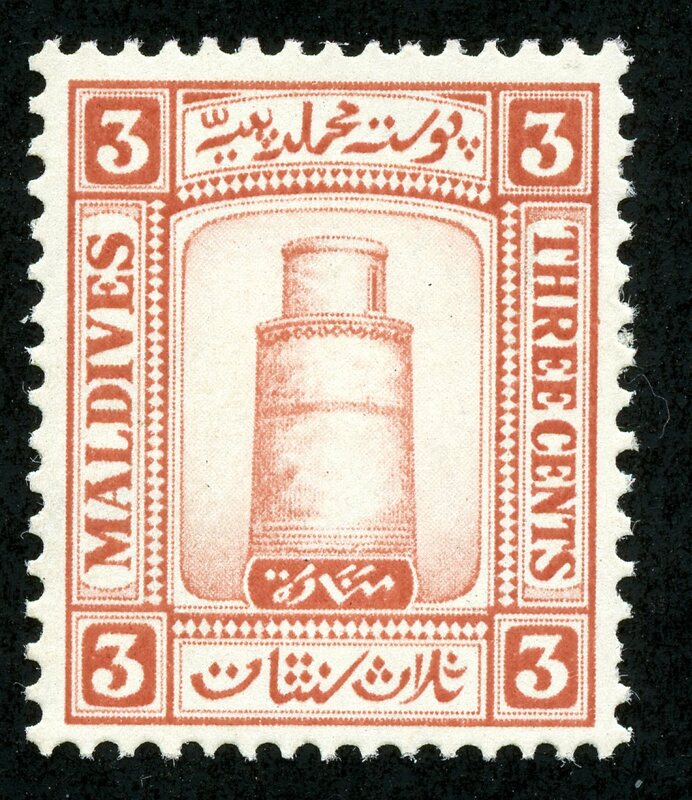 Then, regular stamps of Ceylon were used when the overprint supply was exhausted.. 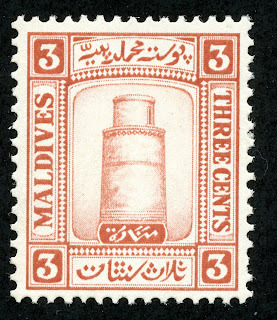 The first set proper just for the Maldives was a 1909 four stamp set with the above design. The CV is <$1-$2+. 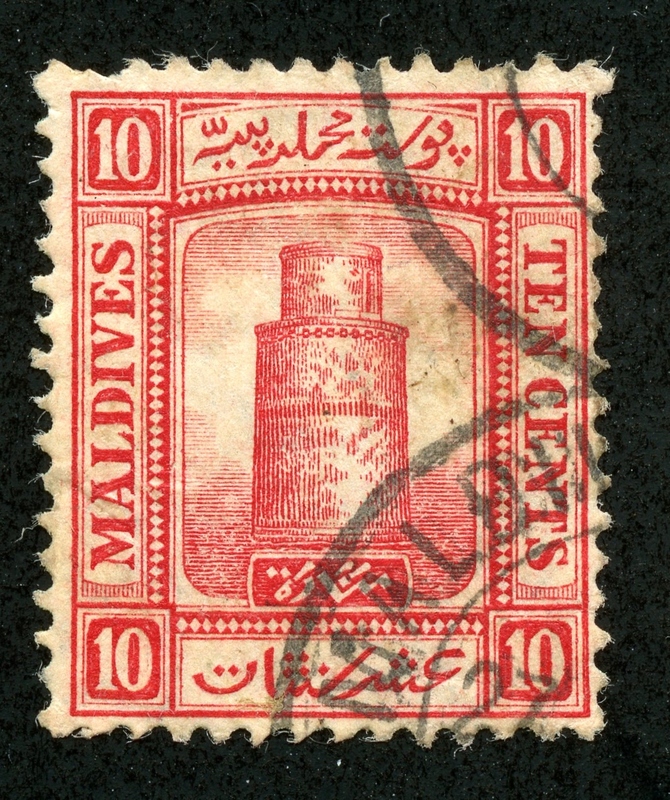 The rather classic design from the 1909 issue was used again, but redrawn, in 1933. One will note the lack of background horizontal lines on the vignette tablet compared to the earlier issue. The nine stamp set has a CV of <$1-$10. The watermark consists of "Harrison & Sons, London" in script. In 1950 and 1952, a nine stamp set with a "Palm Tree and Seascape" pictorial, and a two stamp set with a "Maldive Fish" pictorial were issued respectively. CV for the stamps in the grouping range from CV <$1-$1+ for 10 stamps. That's it. No other issues. The Deep Blue album (Steiner), on two pages, has a space for all of the 30 stamps of the classic era up to 1952. Big Blue '69, on one page, has all 4 spaces for the 1909 issue, and all 9 spaces for the 1933 issue. The 1906 overprinted issue (CV $5-$100+) is rightfully not included. 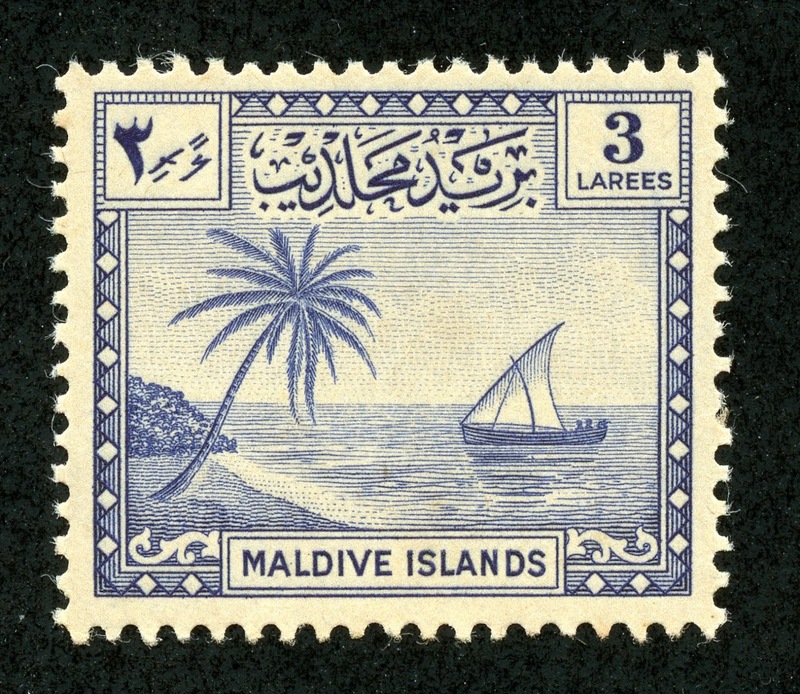 Considering the limited output of the Maldive Islands, BB is rather generous in its coverage. The stamp spaces also include two that cross the $10 threshold. 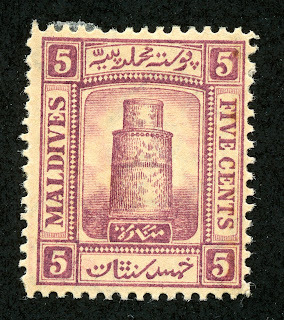 The Maldives had few stamp issues during the classical period. True, like many small island countries, they more recently have issued myriad topicals, some of which have little relevancy to the Maldives as such. But the classical era is clean. Note: Map, Pic appear to be in the public domain. 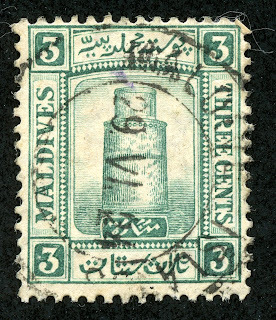 Classical era Maldive stamps illustrate why I collect mainly pre-1940 stamps. Yes, they’re one design, so far as BB is concerned, but they do represent something of significance for the Maldives –a striking minaret of an ancient mosque. 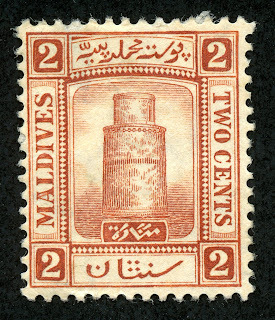 As you say, the classical era is “clean.” Relying on modern Maldive stamps for information about these islands, one might conclude that their museums loaded with Raphaels and Titians and Picassos, that space exploration and butterflies are their national priorities, and that they are ruled by Disney characters. I was surprised and disappointed to see this little island country with its "palm trees and blue lagoons" to have page after page of non relevant topicals in the recent Scott catalogue. That's true of many countries, the so-called sand dunes states in the Gulf, many African countries, and some in South America and Asia. Even the U.S., after all, has issued many series of fairly silly cartoon stamps, TV character stamps, the famous Elvis stamps, and many others. At least these are American subjects, however. The non-native subjects of these other countries quickly grow tiresome for those who have an interest in learning about the culture, history, and sights of a place but get Mickey Mouse and foreign artworks and Olympic Games and endless series of "world leaders" and other stamps designed to pick our pockets. But in defense, I suppose these countries are not wealthy and stamps are a revenue source and no one is forcing us to buy them. 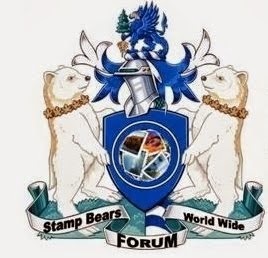 Most unfortunately, however, their stamp history is tossed away by doing this since their stamps are really not about themselves or their history, etc. but more like stickers to be sold for some quick cash. Very sad that any stamp issuing country would cheapen its stamp history this way. As far as collecting them, it's not necessary to stick only to pre-1940 stamps even for countries like these. Buying only stamps that are about a nation's history, people, culture, and so on from the modern era is a good way to collect, omitting all the silly Disney and other stamps. Being selective can be done with many countries over the last 50-60 years or so instead of always trying for an unnecessarily complete collection. That way we can collect those countries' stamps but only the ones we like. This may require designing our own album pages, of course, using blank pages but that should be half the fun. So, for me, I'm not adopting any rigid cut-off date with many countries, but only collecting stamps representative of them historically, culturally, and so forth. Takes a little more effort, of course. All other uses require written permission of the owner. Austria & LV: 1850 "Coat of Arms"
Austria 1867-84: Franz Josef's Whiskers - Coarse or Fine? What stamps were added in 2018 to my collection? How did my collection grow this past 2017 year? What is next for the BB blog now that the checklist is completed? BB Expensive Stamps - Aden to Quelimane and U.S. Which Stamp Album is best for WW collectors? Is the Minkus Supreme the "Goldilocks" Album for WW Classicial Collectors? How did my collection grow this past 2016 year? Note: stamp designs are copyright of issuing postal authorities and their designers.